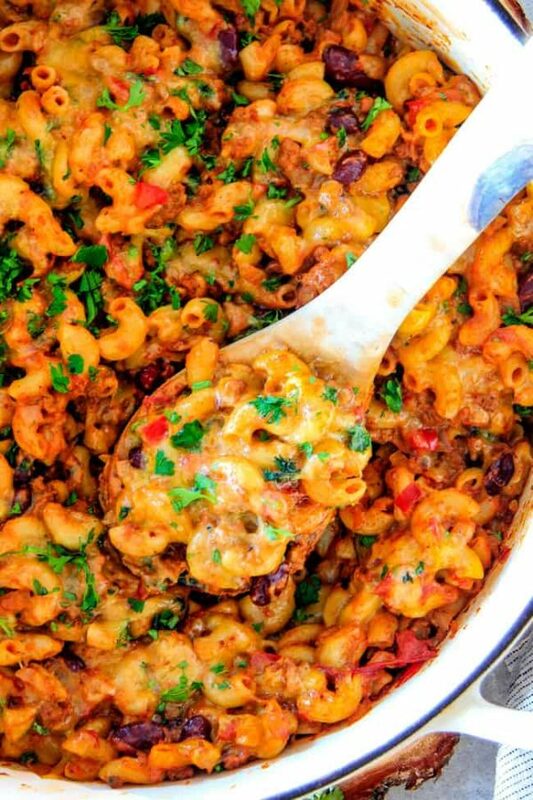 ONE POT Chili Mac and Cheese is super quick and easy, hearty, comforting and just plain DELICIOUS and on your table in under 30 Minutes! 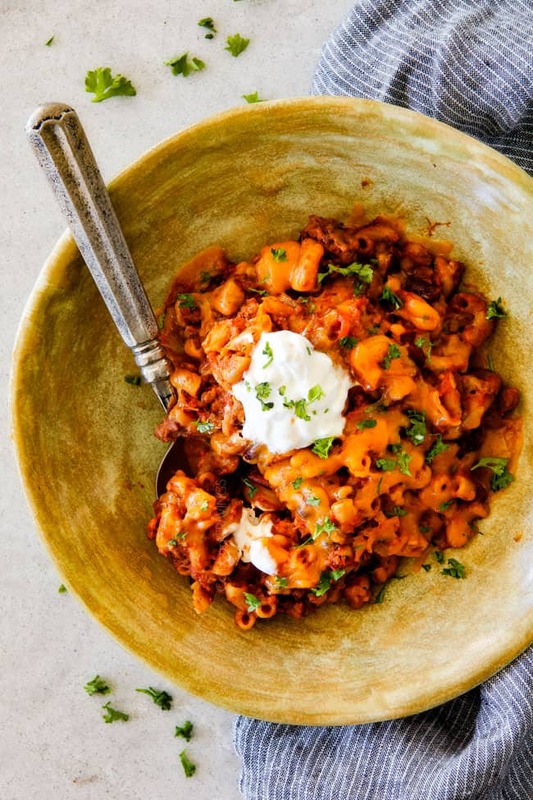 Chili Mac and Cheese is your grown-up version of hamburger helper that tastes 1000X better! It’s Chili Con Carne + Macaroni and Cheese = comforting new family favorite that can’t be beat in taste, comfort or convenience! And did I say one pot already? Can all my Macaroni and Cheese lovers raise their hands? I know your out there as my Million Dollar Macaroni and Cheese has been one of my most popular recipes since I posted it! 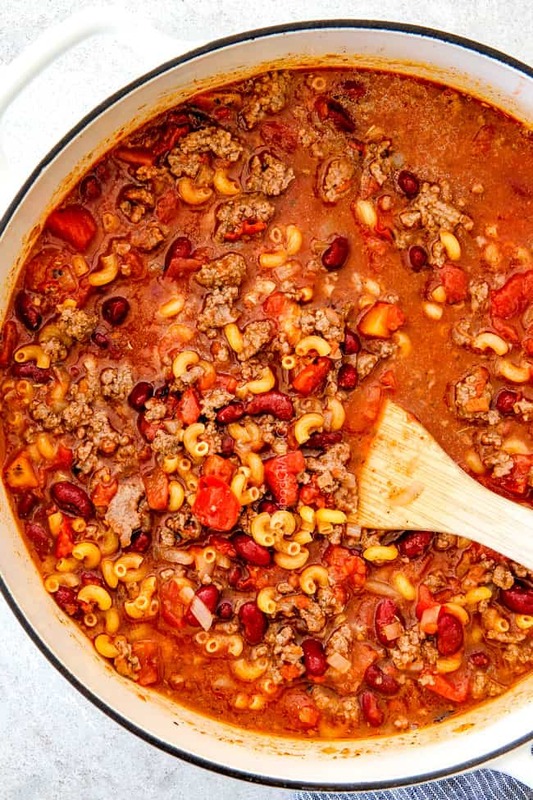 The only other meal I can think of to rival Macaroni and Cheese in comfort is a warm bowl of hearty chili – and when you combine our homemade, easy chili recipe with pasta and cheese into ONE POT – magic happens. The magic of pure comfort food that’s decadently delicious. The magic of your two favorite foods in ONE bowl and made in ONE pot. The magic of using pantry friendly ingredients that are inexpensive so you can make this Chili Mac and Cheese recipe at a second’s notice. The magic of fabulous leftovers. The magic of a meal your whole family will devour and become a new family favorite. The magic of a back-pocket meal that everyone loves! This Chili Mac and Cheese is a long time favorite at our house. I would claim we have somewhat distinguished taste buds at our house. Patrick is my biggest foodie critic and always tells me “its so you don’t get any mean comments.” LOL! But you know one of his all time favorite foods? 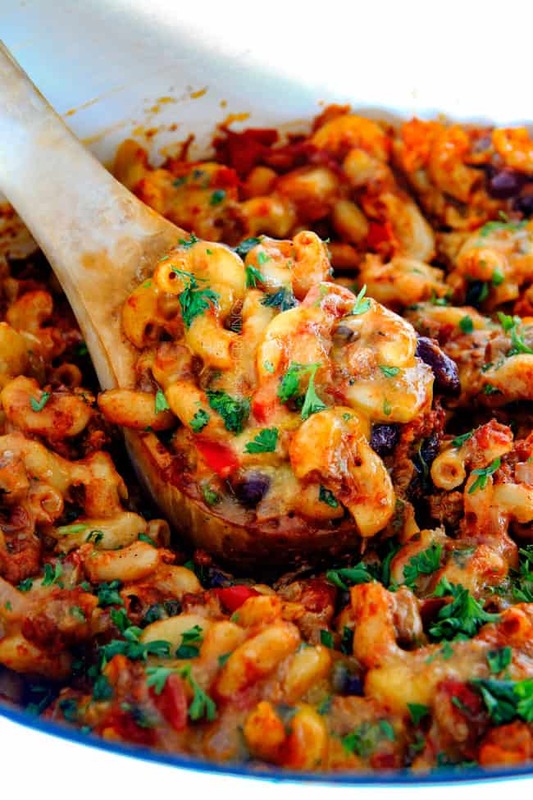 This One Pot Chili Mac and Cheese! And I adore it too. It’s one of those rich, satisfyingly delicious meals that you crave and crave and crave. So it’s a good thing it’s so quick and easy! Followed by our chicken broth and pasta. The addition of liquid smoke is purely optional but I love the additional smokiness it adds. If you aren’t familiar with liquid smoke, it is located near the barbecue sauces at your grocery store. I use it in all sorts of recipes so you won’t just use it once! Next, we cover our pot and bring it to a simmer for 8 minutes, stirring occasionally and replacing the lid. After 8 minutes, remove the lid and continue to simmer approximately 5 minutes, stirring often, just until the pasta is al dente. 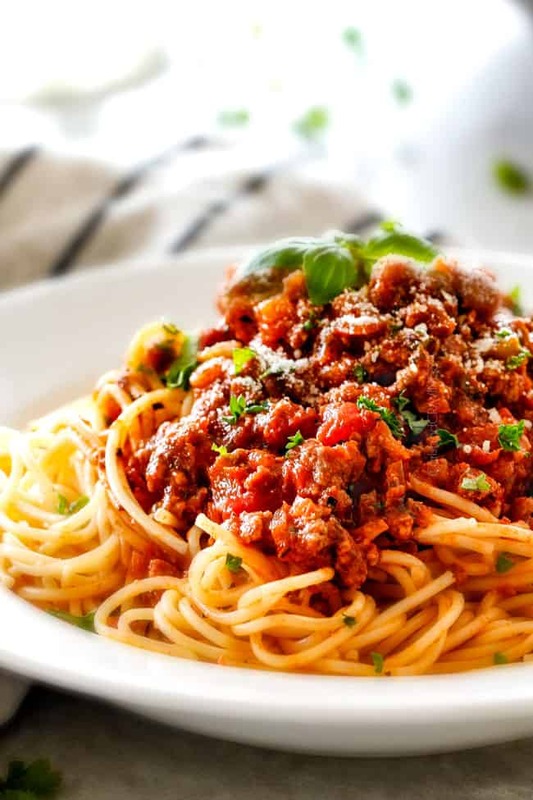 Every stove cooks differently and there are several factors in cooking time such as the type of pot, how vigorous a simmer, how often the lid is opened, etc., so you are going to want to take care to taste the pasta often as it reaches the end of cooking to ensure you don’t overcook your pasta because soggy pasta is NO BUENO! Cooking the pasta without the lid the last few minutes does it few things: 1) allows you to taste the pasta 2) evaporates more water 3) allows you to stir constantly so the pasta doesn’t stick to the bottom as most of the water will be evaporated at this point. As soon as your pasta is cooked, be sure to turn off your stove so the pasta doesn’t keep cooking! 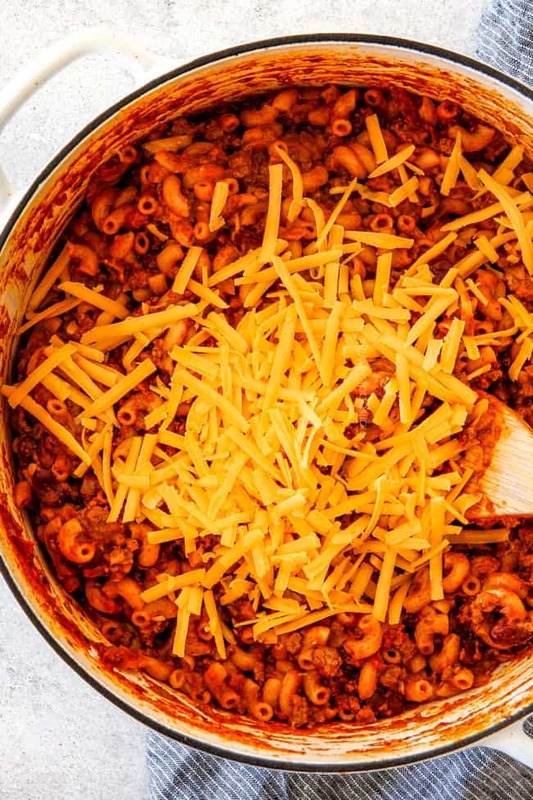 I this point, your Chili Mac should still be a little “saucy.” This creates the perfect base to stir in our cream cheese for extra creaminess followed by our cheese for extra cheeeeesiness. As far as the cheese goes, feel free to add more or less cheese. This Chili Mac and Cheese can be as decadently cheesy as you wish or as minimal – totally up to you! Lastly, top the Chili Mac and Cheese with 1 cup sharp cheddar and replace the lid until melted, approximately 2 minutes. Garnish with parsley if desired. You can serve your Chili Mac and Cheese with crackers, chips or just a spoon. I personally love serving mine with a big dollop of sour cream. The cool luscious sour cream against the multi-dimensional chili –spiced beef, tomatoes, onions and macaroni is the perfect palate pleasing juxtaposition. 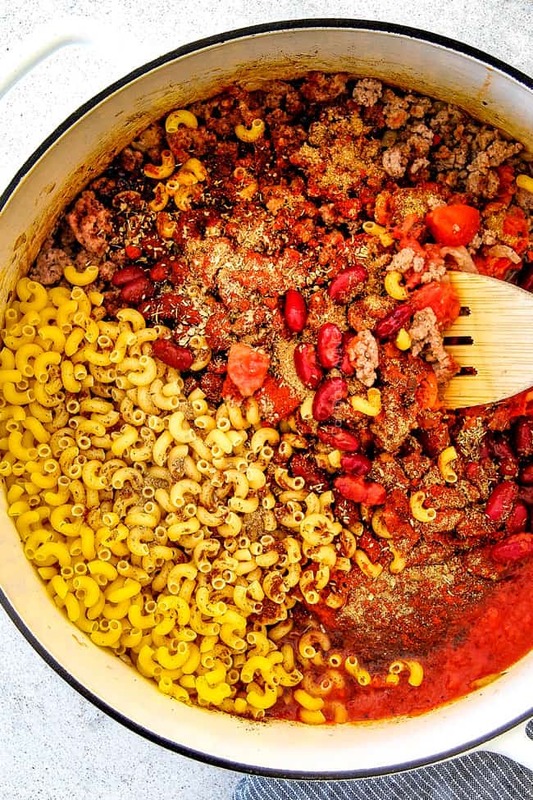 One Pot Chili Mac – magically delicious. 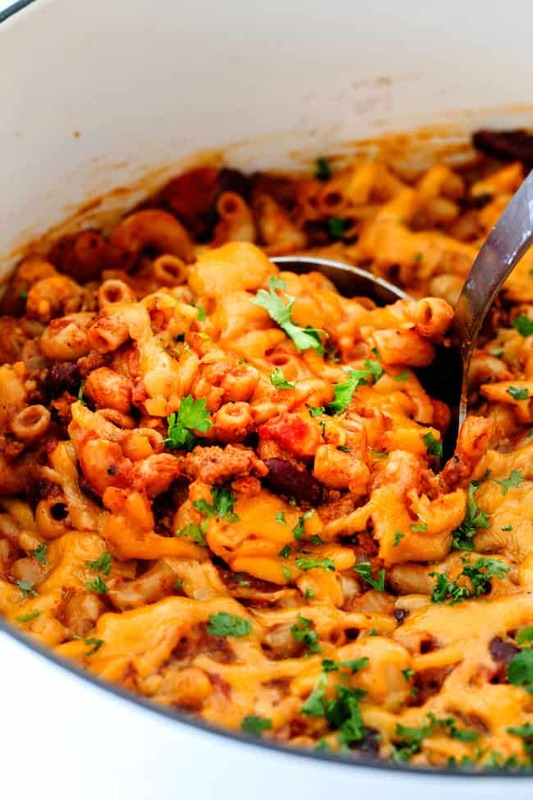 Want to try this One Pot Chili Mac and Cheese Recipe? Pin it to your PASTA, BEEF, ONE POT or 3o Minute Board to save for later! Looking for More ONE POT Pasta Recipes? and Taco Spaghetti – not one pot but only 20 Minutes and SO good I had to include it! 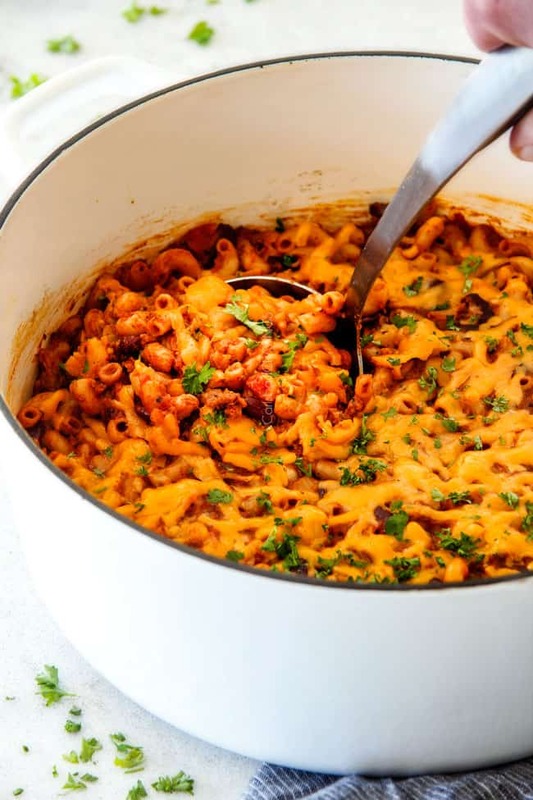 ONE POT Chili Mac and Cheese is super quick and easy, hearty, comforting and just plain DELICIOUS and on your table in under 30 Minutes! 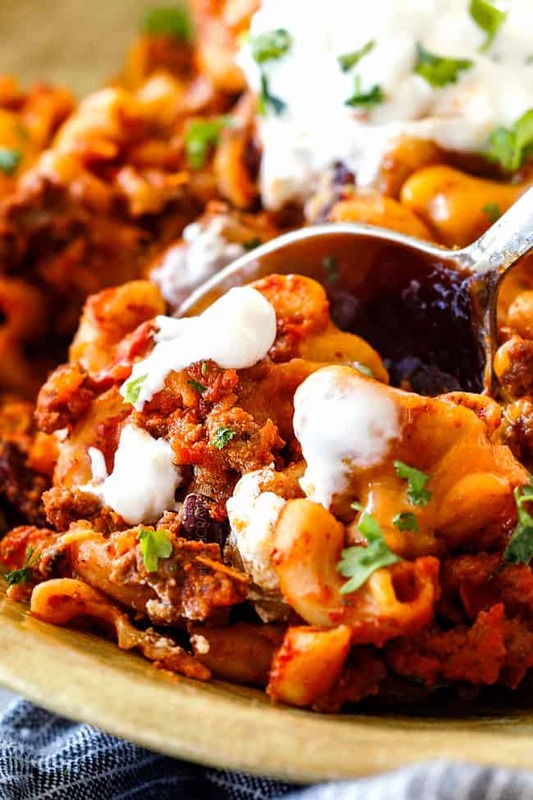 Chili Mac & Cheese is your grown-up version of hamburger helper that tastes 1000X better! It's a comforting new family favorite that can’t be beat in taste, comfort or convenience! And did I say one pot already?! Heat a Dutch oven medium high heat. Add meat and onions and season with salt and pepper. Cook until meat is browned, breaking up meat as it cooks. Add bell pepper and garlic and sauté 1 minute. Stir in crushed tomatoes, diced tomatoes, kidney beans, liquid smoke, sugar, and all seasonings. Stir in chicken broth and pasta. Cover, and bring to a simmer for 8 minutes, stirring occasionally and replacing the lid. After 8 minutes, remove lid and continue to simmer approximately 5 minutes, stirring often, just until the pasta is al dente. Taste pasta often as reaches the end of cooking to ensure you don’t overcook your pasta. Turn stove off but leave pot on the burner. Stir in the cream cheese until melted followed by 1 cup cheddar until melted. Taste and season with salt and pepper to taste (I like more salt). You can add more cheese if you wish - it can be as cheesy or as minimal as you choose! Top the pasta evenly with remaining 1/2 cup cheddar. Replace lid until cheese is melted, about 2 minutes. Garnish with fresh parsley and serve with sour cream. if desired. Awesome Wendy! I hope your hunt stops here for your favorite Chili Mac! Can’t wait to hear how you liked it! Meanwhile, I hope you love the tomato soup! Hi Patti! I’m so happy you enjoyed this recipe and so many others – that makes me so happy! As far as reheating goes, I would add a drizzle of water to your serving and then microwave it until warm. Jen, I understand why you put the pasta in before everything is cooked. Since we are very particular about our pasta (al dente is a bit too done for us), I assume there would be no problem partially cooking the pasta (4 minutes) and then adding it in at the end…. reheating just enough to bring it closer to done. I’d appreciate your thoughts before I potentially ruin an entire meal. Thanks! Hi Monique, when the pasta cooks in the sauce it absorbs a lot of the chicken broth. If you want to add the pasta at the end then I would eliminate the chicken broth and just add what is needed to reach the desired consistency. I hope this helps! This was SO GOOD. I used low fat cream cheese and only one cup of shredded cheese and it still tasted like a decadent meal. Your recipes are so flavourful! YAY! I’m thrilled you loved this recipe Laura! I love flavor and seasonings so I’m glad you do too! YAY! We love good and quick in one recipe! I’m so happy you loved this recipe and found it so easy! That is awesome you make make a recipe of mine at least once a week, thank you! You sound like wonder woman with your twins, cooking and everything else you must have going on! Thank you for taking the time to comment!